Twenty-four hours before departure, the forecast called for north winds and large waves on the lake. On the bay, the winds would be the same, but the waves would be much more manageable. With safety in mind, we decided to take the bay side first and leave the lake side for the return journey. We sailed north out of Sawyer Harbor, tacking back and forth all day and slowly making progress toward Egg Harbor. We had marina reservations, but at this rate, we wouldn’t arrive until after the dockmaster left for the day. We finally gave up and motored the rest of the way so we could make it to dinner with family in Egg Harbor. We ate at Shipwrecked, a brew pub within walking distance of the marina. After only one long day on the boat, we could feel the earth moving under us as we walked. That night we slept onboard. Although small, Moon Dancer has a tent that snaps over the cockpit. After setting up the double bed supports I built last season, we slept quite comfortably on a full-size bed. For navigation we loved using the iPad and inexpensive Navionics app better than the Garmin chart plotter. It has great resolution, a large screen and maximum portability, and we could quickly use it to check weather or the wave forecast, too. The NOAA wave forecast proved invaluable for safely navigating the lake side. The weather forecast alone didn’t provide enough information. The wave forecast gives you a prediction every three hours over the next four days, which we found helpful. Lake Michigan has a long fetch! While the lake side has fewer ports than the bay side, it should not stop you from a circumnavigation. Rowleys Bay and Baileys Harbor both have marinas, and in a pinch, boaters can anchor in North Bay, especially when the water is higher. We have a shallow draft with a swing keel, so it definitely wouldn’t have been a problem for us and was part of our backup plan. 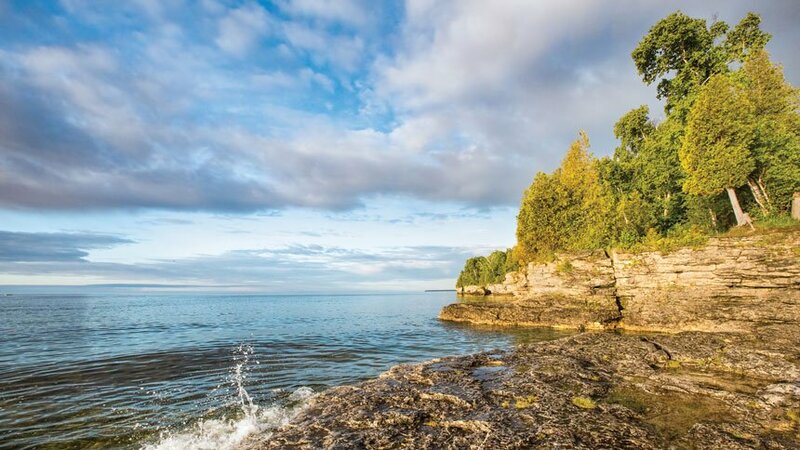 Because of Door County’s popularity in July, you’ll need marina reservations. Although we often changed reservations to accommodate our changing schedule, it was worth doing as slip space was tight. We continued sailing north past Fish Creek and anchored at Shanty Bay near Peninsula State Park. Although it may not have been necessary, we set a second anchor just to be secure. We don’t have a dingy, so we hailed a nearby yacht whose occupants brought us to shore in their dingy so we could attend a musical at Northern Sky Theatre that night—the perfect end to a day of sailing. We paid them with two homemade gingerbread cookies and reassured them we would swim back to our boat with the help of a dry bag for our clothes. We’d done it before. During a sleepy, windless sail up to Ellison Bay, we got out the fishing gear and trolled for salmon in the deep waters beyond Sister Bay to pass the time. We motored into Ellison Bay and had a challenging time finding our reserved dock at the Liberty Grove Town Marina. Although the marina has few amenities, the price was right, and we were within walking distance of several great restaurants, including the Wickman House and the Fireside. After a lovely morning swim and great coffee at Brew Coffeehouse, we set out for Rock Island. Fifteen-knot winds out of the east sent Moon Dancer flying. We took some beautiful pictures of the Washington Island cliffs and soon had the Rock Island boat house in our sights. We had a reservation at Jackson Harbor on Washington Island but decided to get a spot at the Rock Island dock. It doesn’t have a lot of room on the inside wall, and the spots can’t be reserved. You have to watch out for the Karfi ferry, which goes between Rock Island and Washington Island on the hour. The wind had us coming in pretty hot, but we spotted open space at the Rock Island dock and decided to beat the ferry there. What a great decision! We got a spot and paid for overnight docking on Rock Island, so we didn’t need to stay at Jackson Harbor. We have a friend spending the summer as a naturalist on Rock Island, so staying on the island made visiting easy. We hiked the island, visited our friend and stayed a second night just for fun. With abundant history and beautiful hiking, Rock Island is worth a visit. Janelle and Eric on Moon Dancer in front of Rock Island’s famous boathouse. We got up early for our big sail down to Rowleys Bay. With the winds and waves in our favor, we had a beautiful sail around the north side of Rock Island with spectacular views of the Rock Island Lighthouse. However, once we rounded the island and headed in a more southerly direction, the waves picked up, and the wind came out of the south. We tacked a few times, but with late afternoon thunderstorms predicted and the entrance to Death’s Door ahead of us, we motored to get a head start. Once past Washington Island, we began long tacks, and then the wind dropped. Since we had a good trolling speed, we tried our luck fishing the legendary Four Foot Shoal at the entrance to Rowleys Bay. Although we didn’t catch any fish, we had an amazing view of thousands of cormorants. Our next challenge was navigating into Rowleys Bay and finding the Rowleys Bay Resort. With thunderstorms predicted, we were anxious to get off our boat. We initially went to the wrong dock but soon figured out we needed to go deeper into the harbor. With lightning a possibility, we called ahead to book a room at the resort. After securing the boat, we grabbed our necessities and took removable items, including electronics, off the boat. That night brought heavy wind, lightning, rain, and lots of texts from friends and family asking about our safety. We evaluated the weather before bed and again in the morning and decided to stay another night; besides, Grandma’s Swedish Bakery was at our doorstep, and we wanted to explore the Mink River Estuary. We rented a two-person kayak and spent almost three hours kayaking up the estuary and returning against huge waves coming in from the lake. Just as we returned, a deep fog from the lake settled in, making us glad not to be sailing in that. We finished the day with an authentic Door County fish boil at the Rowleys Bay Resort while contemplating our route to Baileys Harbor the next day. Janelle cooks aboard Moon Dancer in Egg Harbor. We found a good Samaritan to give us a ride to Ellison Bay to buy gas for our outboard and then set sail for Baileys Harbor. The waves ranged from 3 to 5 feet, and the north winds blew at more than 20 mph with greater gusts at times. We expected this, and having no roller furler, we decided to skip a foresail and just go with a mainsail. We tried reefing but didn’t like how the boom was slightly lower. 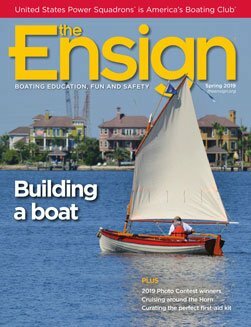 (I learned the following weekend at a Door County Sail & Power Squadron seminar that I could have done this another way.) We were in control and having fun surfing with amazing following waves that occasionally got us going over 8 knots! Having to turn upwind into Baileys Harbor was less fun. Tacking really didn’t seem like an option as the waves were huge, we were dead against the wind, and we really needed to pay attention to our course to avoid shallow areas. We pulled down our sail and motored the bucking bronco Moon Dancer had become. Eric donned full rain gear and got drenched in the waves and water washing over the deck. I went below to get more weight forward and navigated from below with Navionics. After making it to Baileys Harbor Town Marina, we were glad to have a spot to tie up and relax. The marina has helpful staff and excellent amenities, including full showers, a lounge and picnic areas. The marina is right next to Nelson’s Hardware, where you can find anything you could possible need, and has wonderful restaurants within walking distance. Eric with Sturgeon Bay’s historic Michigan Street Bridge in the background. With a long sail ahead of us, we woke early to a beautiful, sunny day with low winds out of the east-southeast. We trolled while enjoying the views of Cave Point, Whitefish Dunes State Park and my own property, which I rarely see from this vantage point. Using the depth finder, we ventured as close as we dared and enjoyed an offshore picnic lunch. Before we knew it we had the Sturgeon Bay Canal beacon in our sights and were almost home. 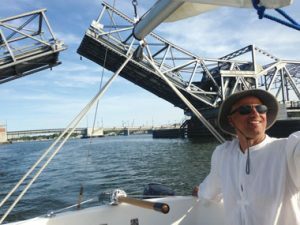 We motored through the canal and sailed wing on wing up to and under the highway bridge. For the first time, we hailed the bridge tender to tell him we were awaiting the scheduled Oregon and Michigan Street bridge lifts. For once, we stopped traffic instead of waiting on others; that was kind of fun! After motoring through the second bridge into the Sturgeon Bay ship canal, we set sail for our final leg to Sawyer Harbor with another gorgeous evening sail—a fitting end for our first circumnavigation of the Door! 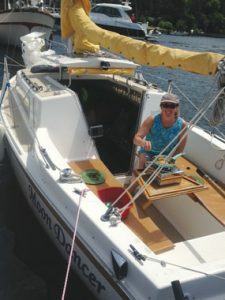 Janelle Peotter, P, of Door County Sail & Power Squadron/10, a retired school social worker, enjoys sailing with her husband, Eric Perlman, a chiropractor, aboard their Aquarius 21, Moon Dancer. Janelle took many USPS courses to prepare for this trip, which the couple would like to repeat next summer.